Imprisoned for 'inflammatory writings' by the totalitarian Theocracy, shy intellectual Ashleigh Trine figures his story's over. But when he meets Kieran Trevarde, a hard-hearted gunslinger with a dark magic lurking in his blood, Ash finds that necessity makes strange heroes... and love can change the world. Don't be put off by the front cover this book is an excellent read. I was put off by the front cover so it took me ages to finally get down and read it. But thank god I did, what an amazing epic story. 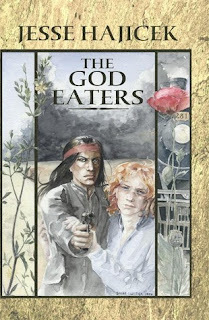 The God Eaters tells us a tale of adventure love and suspense. Set in an alternative universe where magical abilities are present in some people, and a dictatorial government which has tight control over who can use their abilities Kieren and Ash get thrown together on the train to prison. Karen for murder and robbery and Ash for rebellious propaganda. Both have Talents and they find prison is not just a place for criminals but a government testing ground. Surviving prison is only made possible for Ash because of the growing relationship between him and Kieren, as they try to plan their escape. This book may look long, however it is gripping and the pages flash by, I honestly could not think past the next page, I was totally captivated. The world building and characterisation are rich and vivid, and the characters development as well as the relationships building is riveting. 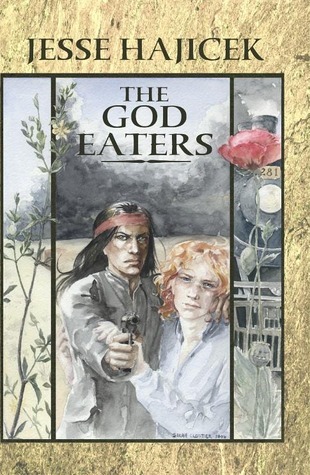 I was enchanted by Kieren andAsh's fight for freedom and their desperate heart aching love for one another. The ending is gripping and truly satisfying. Would recommend to anyone who enjoys Ginn Hale's work and loves a good Western.